This is a limited edition palette comes with 4 of versatile highlighting powders with light-reflecting pigments - Devotion (Cool Highlight), Indiscretion (Warm Rose Gold Highlight), Addiction (Glided Gold Highlight) & Seduction (Soft Bronze Highlight). 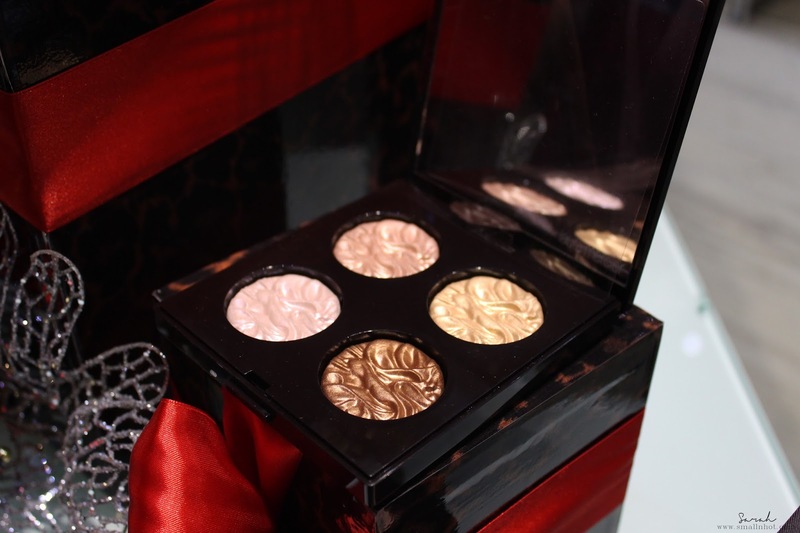 It's a nice palette choice to add natural-looking radiance to your complexion and the fact that it's limited edition, makes it a must get. 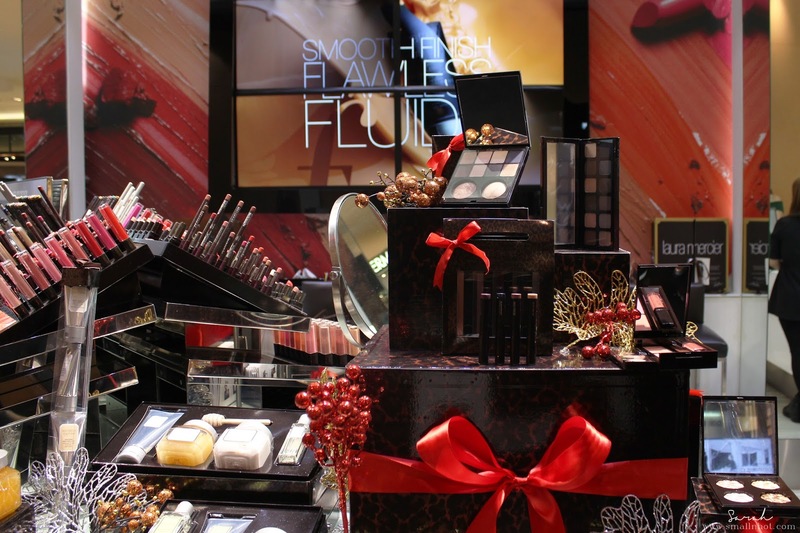 Master Class is another limited edition collection that completes your day to day makeup needs. It consists of 12 eye colours, 3 cheek colours, 2 tightline cake eyeliners, a longwear creme eye pencil and 2 travel eye brushes. I think this could be the ultimate gift set that checks all your makeup boxes. If the Master Class Colour Essentials is too big for your liking, then you can opt for the Essential Art Eye & Cheek Palette. 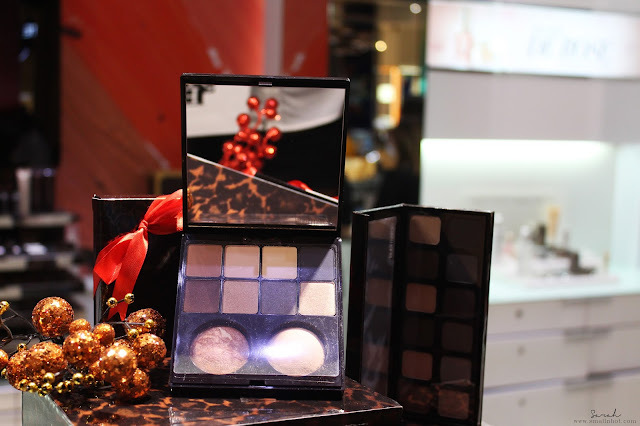 This beautiful palette also comes with 8 wearable brown Eye Colours, 1 Matte Radiance Baked Powder and 1 Baked Blush Illumine. I think the size of the products are pretty decent and you can easily create different day or night looks with this palette. Being a Laura Mercier's fan, I am pretty sure you're familiar with their infamous Caviar Stick Eye Colour. This year, they have created this limited edition Holiday Caviar Stick Eye Colour in deluxe size, making it very purse and on the go friendly. This one comes with 4 shades (Rosegold, Amethyst, Aubergine & Tuxedo). 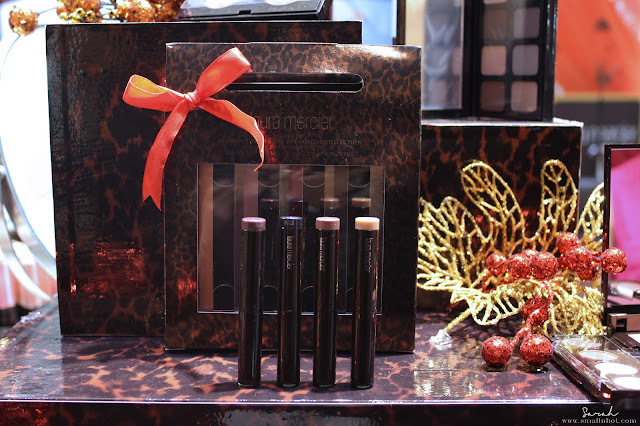 So even if you're new to the Caviar Stick, it's a great gift set for you to experience the beautiful and rich pigment-payoff eyeshadow stick. 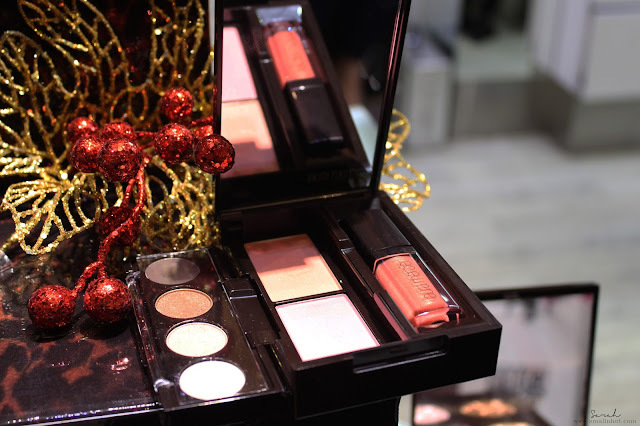 This little thing might look small but it has absolutely everything you need - a huge mirror, 1 simmery pink Lip Glace, 4 wearable neutral Eye Colours and 2 Cheek Colours. Certainly a perfect gift for a girl that loves doing her makeup on the go. 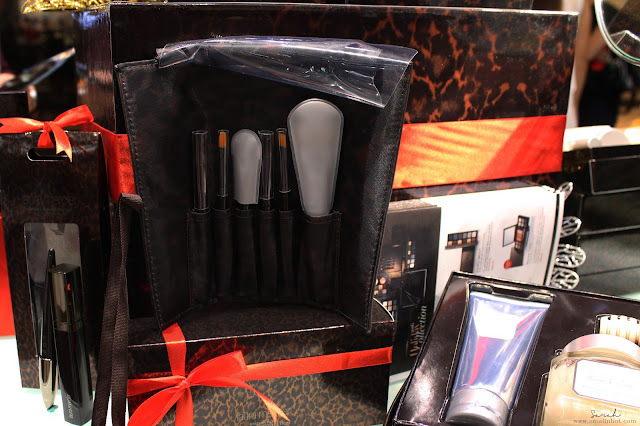 The limited edition brush set, last years favourite has been brought back, but instead of having it in a box, the new set is enclosed in a luxe, professional brush roll, making it travel-friendly. Here's another favourite from last year's holiday collection, the Sweet Temptations. This is one huge holiday set and for the price, it's pretty great. In the box, you'll get the Ambre Vanille Honey Bath, Ambre Vanille Creme Body Wash, Ambre Vanille Souffle Body Creme, Ambre Vanille Eau de Toilette and not to mention the cute wooden honey spoon that comes with it. If Ambre Vanille is not sweet enough for your liking ? Well, the Sweet Temptations Creme Brulee Duet will definitely peak your fancy. The Creme Brulee is a decadent combination of gourmande ingredients including delicious notes of Warm Caramel, Spun Sugar and French Vanilla Bean for a sensual and enchanting experience. The Le Petite Souffles Body Creme set features 6 body creme flavours - Almond Coconut Milk, Ambre Vanille, Creme de Pistache, Fresh Fig, Creme Brulee and Tarte au Citron. This petite Souffles Body Creme makes a perfect gift set to your friends and family because you can either give the whole set as one or wrap up each one individually to give it away. Doesn't that sound brilliant ? 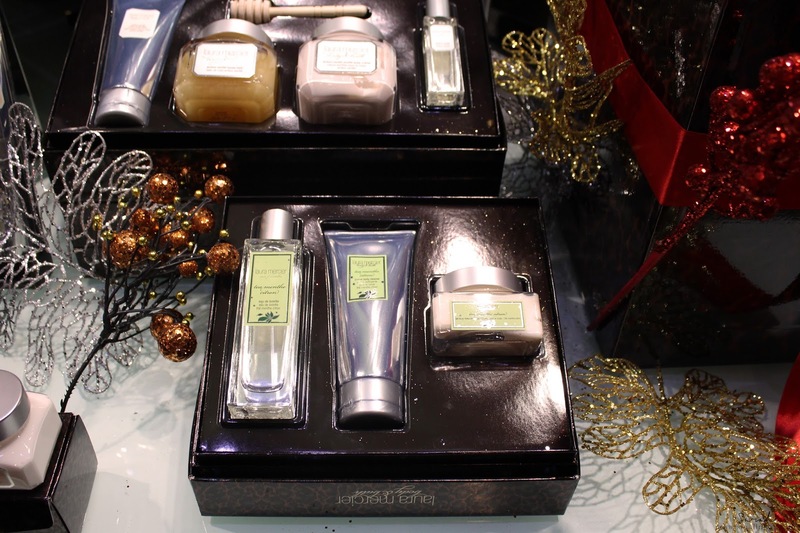 This set consists of the limited edition collection of Tea Menthe Citron Creme Body Cleanse, Tea Menthe Citron Gel Body Moisture and Tea Menthe Citron Eau de Toilette. Lovely set to cover you from head to toe.